Artistic director Emily Molnar’s decision to present a triple bill by female choreographers deserves a special attention as it brings up the importance of fostering more women artists in the dance world. With a hard-hitting programme, that couldn’t have been more passionate and vibrant, Canada’s trailblazing dance company offers a particularly meaningful consideration on themes of human relations, society and passing of time. Even if each work is unique and peculiar, a certain continuity can be perceived among them. First of all in the subjects, as all choreographers delve into deep questions through the intense physical presence of the dancers, and second, in the exceptional versatility and virtuosity that each work demands. None of the pieces carries any sort of narrative, it’s mainly pure dance centred on emotions, converting into a sequence of connections and contacts, group phrases and solos. A high quality performance that emphasizes Ballet British Columbia’s constant development. 16 + in a room opens the evening with a suggestive observation around the nature of time and how humans relate to each other. Emily Molnar imagines what would happen if 16 dancers were placed in a room that can change and tilt on sides. A situation that reveal unknown reactions and consequences, clearly seen in the group phrases, executed in synchronicity or in canon, or when dancers hold on each other continuously gliding around the stage. The movement vocabulary is mainly contemporary with a light classical flavour – women wear pointe shoes and occasionally rise in développé or arabesque. 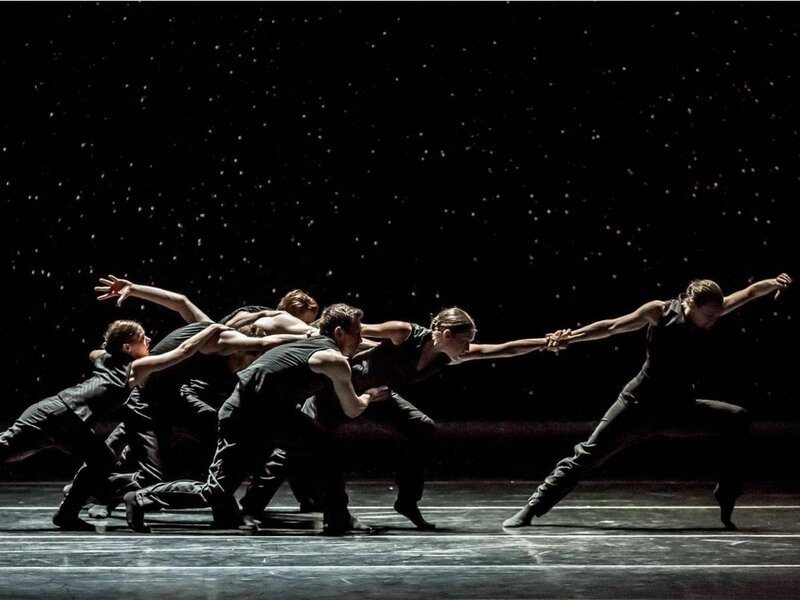 In a fluid pattern, dancers randomly appear and disappear, gather in groups and let go; soloists at turn emerge from the group and women are lifted in exquisite transitions. Dirk P Haubrich’s score, slow at the beginning and very much lively towards the end, set the rhythm for a riveting crescendo of gestures. The performance follows with Crystal Pite’s Solo Echo. Inspired by two Brahms sonatas and Mark Strand’s poem Lines for Winter, the work delves into concepts of loss and acceptance, tracing the path from adolescence to adulthood. Duets unfold in succession carrying intense interactions while snow constantly falls in the background conveying a sense of lightness. There is a lot of contact, particularly in the group sequences, where dancers’ arms seem to be glued to each other as they slide from side to side, a movement that recalls Molnar’s work, but with more tension. In the second part they arrange in a line and hold each other as to form a caterpillar, with most phrases developed with bend knees and low balance. Sharon Eyal, with the help of Gai Behar and composer Ori Lichtik, presents a piece in line with her signature style that stretches dancers’ abilities even further. Bill aims to look at a character from different viewpoints, investigating the collective and individuality, and again, the notion of time. The standout element of the piece is the costume – white hair and white tight body suits that transmit a sense of nakedness and make all the bodies look similar – a visual expedient that also reflects the coloured lights in a magic effect. Bill opens with five solos transitioning from robotic and mechanic gestures to raw movements, followed by group arrangements where at times dancers break from the pattern to find their own individuality. The score varies from drum music to a more pressing rhythm to emphasize the hypnotic flow of quick steps and fluid shifting.